OTTAWA — Ottawa's archbishop has ordered all Catholics to conform in how they kneel during mass, despite widespread grumbling that uniformity doesn't equal sanctity, or even unity. Archbishop Terrence Prendergast circulated a letter recently asking that everyone kneel for the entire Eucharistic prayer from "Holy, holy, holy" to the conclusion "Let us proclaim the mystery of faith" -- about five minutes in all. Archbishop Prendergast said in his letter: "I have noted a wide range of practices ... which present a lack of harmony in a matter where we should be united -- the worship of God. "I know that it may not be easy for some to accept. However, I am convinced its implementation will bring blessings to our archdiocese and I invite your co-operation with this directive." In an interview later, he explained: "It's a sign of reverence. People say, 'I don't like that. We are the people set free, we no longer have to kneel to God,' and I said, 'Wait a minute, we do have to kneel to God. 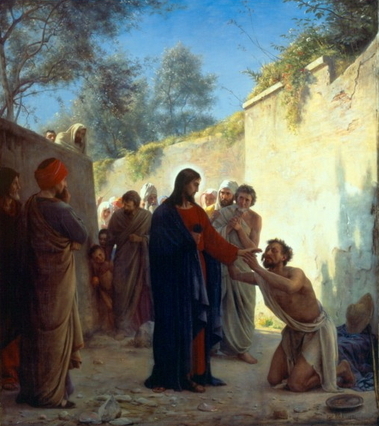 Christ knelt in the garden. People knelt before Jesus. Why can't we do that for a few minutes at mass?' "
One woman told him her husband might not come to church because of this. "She said, 'we French Canadians have a bit of an inferiority complex. We don't like people telling us what to do'." He replied that, if the husband does come, he is free to stand through the prayer, but at the back of the church, where he won't confuse everyone else. It seems a small thing to ask the faithful to kneel during mass, but opponents say that's just the point, especially since it is the archbishop's first firm order since he arrived in this area last year. "Is that all they have to think about?" asked former Ottawa councillor Toddy Kehoe, a parishioner at St. Joseph's parish on Laurier Avenue East. "I don't see the Catholic church as doing loving things. I don't see them as the caring community they should be. It isn't whether you stand or kneel." St. Joseph's Rev. Richard Kelly declined to comment, as did a staff member who said in an e-mail: "It is hard to believe that a kneeler is such a big topic, and I wish I could say something about this piece of furniture that was meaningful, and about the prayer posture we have been requested to assume, but we are in difficult times and the focus for us as a parish is really how can we participate in the truth and reconciliation process with the aboriginal community of Canada." Even Rev. William Burke, associate director of the national liturgy office at the Canadian Conference of Catholic Bishops, refused to comment for fear of fanning the controversy. Canadian bishops have already agreed to adopt this rule when the new missal, or Catholic mass book, is introduced in the near future. Archbishop Prendergast acknowledged the underlying strains. "Every time you talk about liturgy, everything else going on in the church is reflected." Right now, the Catholic church is asking, "Is (the mass) our thing or is it God's thing? There are certain tensions in the church about that. "After 40 years since the Vatican Council, we have gotten away from certain aspects of reverence; we're trying to have more harmony and co-ordination. Harmony will help bolster a sense of divine worship, something that has slipped away. "What has happened with the liturgy is that it is being asked to bear too many things." At one mass, people got so enthusiastic about greeting each other at the exchange of the peace that it took 45 minutes to get back to the pews and resume the service. "That's not what mass is about. It's about worshipping God," Archbishop Prendergast said. "At one time, nobody ever applauded. Now, they applaud for everything. It becomes more like a concert." If someone comes to church and stubbornly stands, they won't be asked to leave. But, the archbishop says, "You sort of wonder, what are they proving when there are two people standing in a church of 500 kneeling? Some people always have to let you know they're right." Reform of the Reform, Delayed? "VATICAN CITY (CNS) -- A Vatican spokesman downplayed a report that major liturgical reforms are being considered by Pope Benedict XVI. 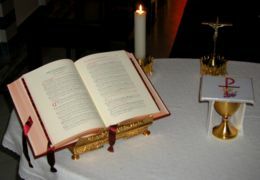 "At the moment, there are no institutional proposals for a modification of the liturgical books currently in use," the spokesman, Father Ciro Benedettini, said Aug. 24. He was responding to a report that a document with proposed liturgical modifications, including a curb on the practice of receiving Communion in the hand, had been sent to the pope last April by the Congregation for Divine Worship and the Sacraments. The article, published by the newspaper Il Giornale, said the document was a first concrete step toward the "reform of the reform" in liturgy planned by Pope Benedict. It said the congregation proposed to promote a greater sense of the sacred in liturgy, recover the use of the Latin language in celebrations, and reformulate introductive parts of the Roman Missal to end abuses and experimentation. The article said the worship congregation had voted on and approved the recommendations almost unanimously during its plenary session last March. The article in Il Giornale said one idea being studied by the worship congregation was a return to celebrating Mass with the priest facing the same direction as the people, known as "ad orientem."" Can true worship be anything but vertical? Finding the “right” mass to go to in the Diocese of Fresno can prove an interesting task. Think Phileas Fogg and you may get some idea of the plethora of mass “types” that can be found in our diocese. Leaving aside the inherent contradiction in the One Holy Roman Catholic Church having a diversity of mass “types,” good solid masses are to be found, both Novus Ordo and Tridentine. Added to this basement layer of liturgical innovation is the true cultural and linguistic diversity o f Fresno. The response has been to have mass in whatever languagess are desirable. This policy means that normally, in the Fresno metro area, that if you want to go to a solid Novus Ordo mass, you better get up early! I don’t know if it’s a Fresno-only phenomenon, but many of the 12 noon masses in town are in Spanish. In the past I have driven over to Our Lady of Victory Church (pic above) whose 12 noon mass is in English. The youth choir makes up with exuberance anything they are lacking in tonality. The old Monsignor, who is the only priest I’ve ever heard say mass there, can at times be quite eloquent in his sermons. 1.) Prior to the mass readings, all of the young children in the Church are escorted out of the Church for Bible study. As they leave, the congregants sing a blessing song, with each raising his or her arm ala a Caesarian salute. 2.) Young people too young to have made their First Communion come up with the communicants, but crossing their arms over their breast indicate to the priest, or Eucharistic Minister, that they want a blessing. WE AS LAY PEOPLE HAVE NO POWER TO BLESS. The one notable exception would be the power a parent has to bless their own child. Priests have the power to bless, abbesses have the power to bless their nuns, superiors have the power to bless the members of their order, but a standard lay person has no such authority. "§ 2. To promote the proper identity (of various roles) in this area, those abuses which are contrary to the provisions of canon 907 are to be eradicated. In Eucharistic celebrations deacons and non-ordained members of the faithful may not pronounce prayers -- e.g., especially the Eucharistic prayer, with its concluding doxology -- or any other parts of the liturgy reserved to the celebrant priest. Neither may deacons or non-ordained members of the faithful use gestures or actions which are proper to the same priest celebrant." I have noticed more and more, with the hand holding during the Our Father, and the wanton word-smithing with the Agnus Dei – a spirit of frivolous and extemporaneous innovation. How many of us have seen other worshippers beginning to mimic the priest in hand gestures, and the actual words of the mass? I know I have with alarming regularity. Oh for the good old days of pre-conciliar clericalism – where priests were priests, nuns were nuns, and heretics were scared! This last Sunday I slept in. Not on purpose, but out of sloth. Arising late, I drove over to my fiance's house where I was fed far too much good food for breakfast, and surprise - WANTED TO THEN TAKE A NAP! I didn't, but I wanted to. She reminded me that we were supposed to go to a local club that evening to hear an "interpretative" music artist. She's into the "art" scene and I tag along as she humors me too in my esoteric tastes, albeit more classical than hers. I give this background as I had to calculate when I would go to mass. No problem - St. Anthony of Padua Church in Fresno (pic below) has a 3:30pm Tridentine mass that I have always wanted to attend, but never had. I have attended Tridentine masses in the past, and have always been struck by the completely different "aura" one feels when entering spaces where the usus antiquior is celebrated. 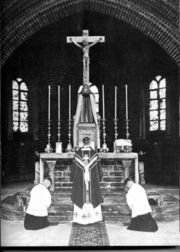 I could write a point by point reflection on the "superior" aspects of this rite, but I want to focus on one of its great deficiencies, UNLESS THE PRIEST IS PROPERLY TRAINED - YOU CANNOT HEAR WHAT IS GOING ON. The priest who said the Latin Mass at St. Anthony's yesterday was both old and foreign. I would guess Spanish by his accent. His Latin pronunciation was superb, when audible - which was regrettably not the case most of the time. Most of the time you could sense that someone was mumbling in front of the altar, but what was said - even from the limited angle of just trying to follow along in the missallette - was not possible. Is there some rule against microphoning the old rite? I know that some of the prayers are actually titled "secret prayer," so maybe the microphone could be turned off at those times - but otherwise I don't see any harm in HEARING what is going on. Have any of you had a similar experience? In the eastern rite, and in Orthodox Churches, the priest is separated from the people by the iconostasis, but a deacon is left on the congregant side of that great divide to lead the faithful in prayers in singing. I know that there has also been talk about restoration of the NOVUS ORDO being celebrated AD ORIENTEM, but even in those instances I think people will want to HEAR what the priest in praying (on their behalf) to G*d.
"What the son rejects the grandson embraces." 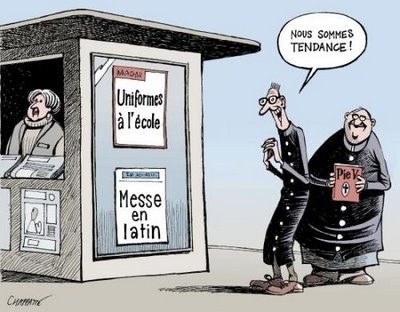 "Vatican Approves New English Translation for Mass." At the Consecration, the priest will refer to Christ's blood which is "poured out for you and for many"-- an accurate translation of pro multis-- rather than "for all" in the current translation. In the Nicene Creed the opening word, Credo, will be correctly translated as "I believe" rather than "we believe." When the priest says, "The Lord be with you," the faithful respond, "And with your spirit," rather than simply, "And also with you." In the Eucharistic prayer, references to the Church will use the pronouns "she" and "her" rather than "it." In the Agnus Dei, the text cites the "Lamb of God, who takes away the sins of the world," rather than using the singular word "sin." In the preferred form of the penitential rite, the faithful will acknowledge that they have sinned "through my fault, through my fault, through my most grievous fault." Throughout the translation of the Offertory and Eucharistic Prayer, the traditional phrases of supplication are restored, and the Church is identified as "holy"-- in each case, matching the Latin original of the Roman Missal." Is there any question as to who worship is being directed towards in this liturgy? We may not have the posture of the old mass any more, at least in universal usage, but by G*D we can get the rock solid language of the old mass back! 3. )An Italian story from Panorama magazine. Nonetheless, given the chatter on Maximus’ post about Eucharistic prayer IV, I think it interesting that the Pope is considering the words of consecration being said in Latin regardless of which prayer is used. which I know won’t happen, I think this would be GREAT! Pope weighing changes in Novus Ordo? Pope Benedict XVI is considering changes in the Mass, according to an Italian publication. The weekly Panorama reports that the Holy Father has asked the Congregation for Divine Worship to study the possibility of changes that would include using Latin in the Eucharistic Prayer and moving the Sign of Peace to the Offertory. The New Liturgical Movement web site, which brought the Italian report to the attention of English-speaking readers, cautioned that the Panorama report should be treated with "great caution." The Panorama story itself suggests only that the Pope has asked for a study of the proposals-- not that he is prepared to implement the changes. According to the Italian weekly, the Pope is weighing the use of Latin for the formula of Consecration at Mass. He may also be leaning toward the use of Latin in other sacraments. 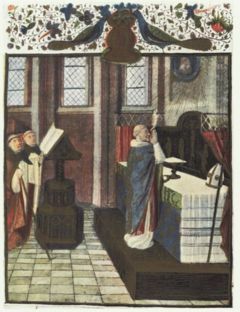 Pope Benedict has often expressed a desire to enrich the post-conciliar liturgy by incorporating some aspects of older liturgical practices. The proposed changes could be seen as part of that process. CWN has not been able to confirm the accuracy of the Panorama report. Why Not Eucharistic Prayer IV? For many years, I have wondered why Eucharistic Prayer IV is so rarely used? It beautifully expresses God's love for us, and His determination throughout history to bring us to salvation. I think it better conveys a sense of salvific history than the other Eucharistic prayers. Yet, I can't recall ever hearing it used in a Mass (and I'm 44 years old). I'm interested in our readers' opinion as to why that might be. According to this Zenit FAQ, Eucharistic Prayer IV may be used during Ordinary Time -- but it would be extraordinary if it were, at least in my Diocese. I have wondered if it is considered by too many priests to be overly "patriarchial" due to the frequent appearance of words like "men" and "man." According to Card. Castrillion Hoyos, the Holy Father desires that the TLM be a normal part of parish life. He also says that priests should offer it in their parishes even if there is no specific request for it. That's a very different message than the one given here: Ex-Papal Liturgist, Archbishop Piero Marini: Liturgical Renewal "Irreversible"
Darío Cardinal Castrillón Hoyos (born July 4, 1929) is a Colombian Cardinal of the Catholic Church. He was Prefect of the Congregation for the Clergy from 1996 to 2006, and currently serves as President of the Pontifical Commission Ecclesia Dei. 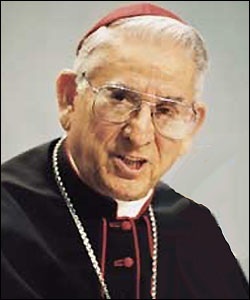 Elevated to the cardinalate in 1998.